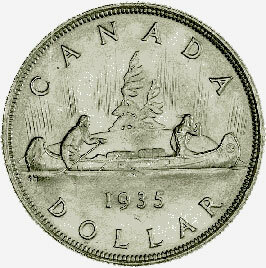 The depiction of a canoe on the 1935 silver dollar marked the first attempt to "Canadianize" the designs on the country's coinage. In 1937 a completely new set of coins was issued with designs highlighting themes drawn from Canadian wildlife and flora. These designs, including the famous beaver on the 5-cent coin, grace our coins to this day. Although legislation was passed in May 1910 authorizing the striking of silver dollars in Canada, a series of events - a change in government, the First World War, high silver prices and, finally, the Great Depression - delayed their appearance until 1935. In November 1934, Emanuel Hahn, an eminent artist and sculptor, was commissioned to design a silver dollar to commemorate the 1935 silver jubilee of King George V's accession to the throne. Hahn's original design was rejected by the Minister of Finance, Edgar N. Rhodes, who then suggested a design involving the concept of a canoe with a voyageur or a Native Canadian. Hahn's representation of this idea, approved with only minor modifications by the Minister, was truly evocative of Canada: a voyageur and a Native Canadian paddling a canoe form the central motif, against a background of northern lights and wind-swept trees on an islet. CANADA appears above the design, with the date and denomination below. In the canoe are trade bales, one of which bears the letters HB for the Hudson's Bay Company, recognizing the role the Company played both in trade and in opening the country. The initials of the artist, E.H., appear under the back end of the canoe. This popular reverse was used on all Canadian dollars struck between 1935 and 1967, with the exception of commemorative designs used in 1939, 1949, 1958, 1964 and 1967. When the nickel dollar was introduced in l968, the voyageur and Native Canadian design was retained and, with the exception of 1970, 1971, 1973 and 1974, was used until 1987. Silver dollars and their successors, the nickel dollars, did not enjoy a wide circulation but were extremely popular as gifts and souvenirs. The silver dollar illustrated forms part of the National Currency Collection, Bank of Canada.